This past weekend, September 22-23, IMLS staff joined thousands of book lovers for the 2012 Library of Congress National Book Festival, celebrating books that have shaped America. President Barack Obama and First Lady Michelle Obama acted as honorary co-chairs of the free festival featuring author appearances and eight pavilions with special presentations, games, and photo opportunities. 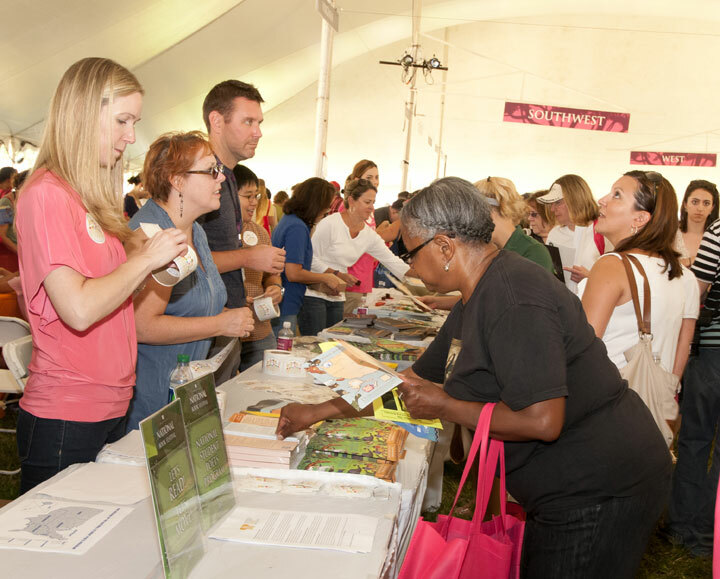 More than 125 bestselling authors, illustrators, and poets joined visitors at the National Mall for discussions and book signings. As we have in the past, IMLS supported the Pavilion of the States, featuring library representatives from all 50 states, the District of Columbia, and U.S. territories. The tables offered children and adults the opportunity to learn each state’s unique story. The pavilion buzzed with excitement as children raced to all 50 state tables to get stamps on their United States maps and to receive a prize when the map was complete. IMLS staff share information with pavilion visitors. This year’s book festival was especially exciting because it was the launch of the National Student Poets Program, which we are supporting in partnership with the President’s Committee on the Arts and Humanities and the Alliance for Young Artists and Writers. This year five outstanding high school poets exhibited original work, demonstrating creativity and dedication to poetry. Together the students will serve for a year as literary ambassadors for poetry, encouraging their peers to explore and develop their own creative works. So look for them at a reading near you. Believe me, you will not be disappointed! Left to right: Susan Hildreth, Virginia McEnerney, Executive Director of Alliance for Young Artists & Writers, Student Poet Natalie Richardson, and PCAH Co-Chair Margo Lion. The National Book Festival is a great opportunity to highlight the power of books, authors, and the great and varied reading traditions of our country. If you were not able to attend the festival, all is not lost! You can listen to author presentation podcasts on the Library of Congress website and see interviews on the library's YouTube channel.